People familiar with the Jakarta performing arts scene might find that local performance halls rarely feature performing arts from India, particularly those coming from its southern province of Tamil Nadu. Therefore, the recent Sangamam 2017 arts and culture carnival organized by the Indonesia Tamil Sangam (ITS) served as a great way to introduce the mind-blowing performing arts tradition coming from the area to Jakarta art lovers. The event, hosted at the JIExpo in Kemayoran, Central Jakarta, on April 8 from 5 p.m. onwards, is an annual signature event organized by ITS to showcase cuisine, traditional games and performing arts from the Tamil-speaking community. The event is open to the public. The Tamil language comes from the Indian province of Tamil Nadu. It is widely spoken in many Asian countries like India, Singapore, Malaysia and Sri Lanka, where many members of the Tamil community live. ITS was established as a legal entity in Indonesia in 2011 and is joined by around 400 Tamil family members in Indonesia who actively participate in the activities of the sangam, which means association. “The carnival itself seeks to celebrate the New Year in our state a week prior to the date,” said ITS president Ramachandran Ramesh. The Tamil New Year’s Day almost always falls on or about April 14 on the Gregorian calendar. The celebration in Jakarta was indeed festive: joined by hundreds of people, it featured a number of food stalls, traditional games as well as a stage that never ceased to showcase mindblowing dances, acrobatic as well as music performances from the area, bringing the open-air venue of JIExpo’s Gate 2 to life that evening. Most of the event’s attendants were from the Tamil community, but also a number of Indians as well as Indonesians could be spotted here and there in the venue. For the carnival, ITS brought six performers from the Tamil state to entertain Tamil people in Indonesia. They included Amala Madurai Muthu and M. Panner Rajan, who specialize in performing poikkal kuthirai (horse dance) and mayilaattam (peacock dance). Musicians represented by the duo featured naadhaswaram (wind instrument) player Pandiaraj Alagu and thavil (percussion) player Krishnamoorthy Kadhiresan. A dancer named Thangapandi Thuraisamy, meanwhile, performed the karagattam dance. While the sky was still bright at around 5 p.m., Alagu and Kadhiresan set the mood for the evening with their performance. The rhythmic beats of the percussion, along with the flowing sound of the wind instrument, which resembles that of a clarinet, were combined to create a hypnotizing ensemble of a long composition. Then a number of dance performances by both children and adults were presented, bringing forth a completely different feel with explosive dance music tracks as backup. It is fair to say that the most exciting part of the carnival happened when Muthu and Rajan started to showcase their horse dance. The performance requires the dancers to wear a horse costume and dance around in quick movements dressed in these heavy outfits. This segment of the show also signified that a lot of performing arts from the Tamil state incorporate either heavy animal-like costumes or acrobatic elements; the peacock dance also featured a huge peacock animated by two dancers beneath the costume moving around in graceful motion. Both horse dancers were outstanding in terms of their agility as they performed difficult pirouette-like movements and jumped around gracefully while wearing the outfits. Then they started to perform acrobatic acts that caused a nerve-wracking effect on the audience. Everybody fell silent when the performers took their turns to be blindfolded and either slice off a banana held in someone’s mouth or crack open a coconut held in someone’s hand. There was also an adrenaline spiking performance held at the fringe of the venue, with performers carrying and balancing an burning spinning wheel above their heads. This acrobatic element involving blindfolded people was also present in the uriyadi game, which was joined by visitors above the age of 18. The game required participants to break open a pot with a long stick while being blindfolded. The trick is this: the pot was suspended with a rope on a pole, with people constantly moving it up and down, changing its position all the time. It is a tough job, guaranteed: Nobody succeeded in breaking the pot open that evening. 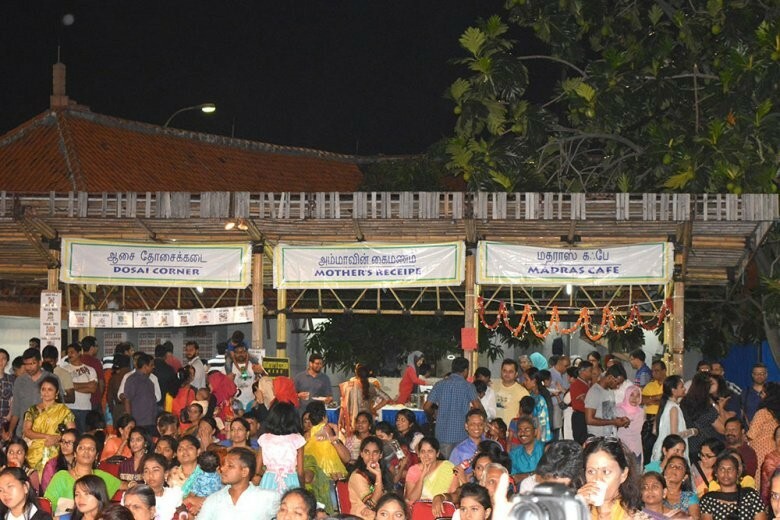 Guests appeared highly animated during the event, with people consuming food and drinks offered on the fringes of the venue. When the formal event ended at around 10:30 p.m., they did not seem to want to stop the fun: People soon took the stage, asking the disc jockey to play music to accompany their spontaneous collective dance performances. People standing at the back of the venue did not want to miss the fun either: They danced and screamed in synchrony with the spontaneous dancers who took their turns to occupy the stage.